"3rd T20I. 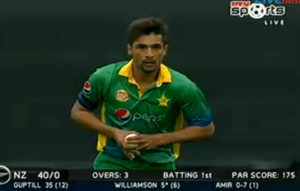 3.6: M Amir to K Williamson, 4 runs, 46/0 bit.ly/nzvspak3 #NZvPak "
#PAKvNZ Aj tw 200 hnge lgta h..
"@ICCLive : 3rd T20I. 3.6: M Amir to K Williamson, 4 runs, 46/0 bit.ly/nzvspak3 #NZvPak "
Wellingtom Ground Par Ab Tak 6 T20I Matches Khely Ja Chuky Hai Aur 2nd Bating Karny Wali Team Ne Tamam Matches Jeety Hai. #NZ 46/0 after 4 overs.